Chief Executive of the Equality Commission NI. The Northern Ireland Assembly was delighted to sign up to a new initiative this week designed to encourage organisations and businesses across Northern Ireland to consider if they can improve the service they offer to clients and customers with a disability. ‘Every Customer Counts’, an initiative spearheaded by the Equality Commission recognises that a significant proportion of our population may not be receiving the same standard of service that those without a disability enjoy every day. In Northern Ireland 21% of the adult population and 5% of children have a disability. 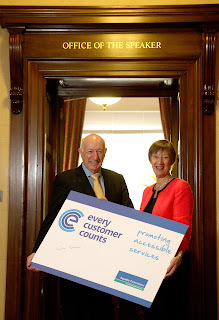 "I am delighted on behalf of the Northern Ireland Assembly to sign up to the ‘Every Customer Counts Initiative’. Parliament Buildings belongs to the people of Northern Ireland and we have for many years been working to support and encourage people to visit to learn more about and become involved in the democratic process.